YoYo Games (www.yoyogames.com) announced yesterday that GameMaker: Studio, the cross-platform games development environment, will support upcoming Windows 8 and Windows Phone 8. The studio enables developers to create games in a single code base and subsequently export with ease to multiple platforms and formats. Current level of support includes HTML5, Facebook, Android, iOS, Windows and OS X. GameMaker: Studio for Windows 8 is stated to be available for developers prior to the OS launch, while support for Windows Phone 8 will reportedly arrive following device availability. "We are thrilled to be working closely with Microsoft to launch GameMaker: Studio for Windows 8 and Windows Phone 8. The beauty with GameMaker: Studio is that it’s extremely easy for developers who have already or are currently developing with our environment to have Windows Style UI games ready for publishing on Windows 8 and Windows Phone 8 in a short amount of time." 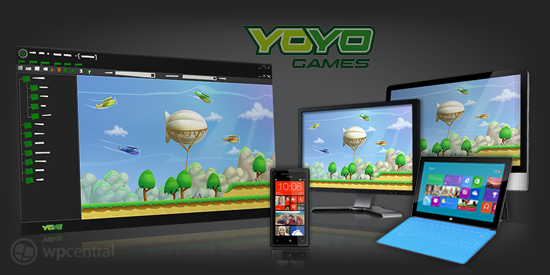 "We are excited that YoYo Games is bringing Windows 8 and Windows Phone 8 publishing to the GameMaker: Studio™ development community,” said . “We are looking forward to expanding the Windows 8 development community and the breadth of apps available across Windows 8 and Windows Phone 8." GameMaker has been developed with usability and efficiency in mind, which introduces functionality such as drag-and-drop to create a simple yet powerful environment. There are a number of showcases available on the YoYo Games website that make the possibilities for Windows Phone appear exciting. We'll be able to add GameMaker to the list of supported developer tools, which will include the likes of Unity.